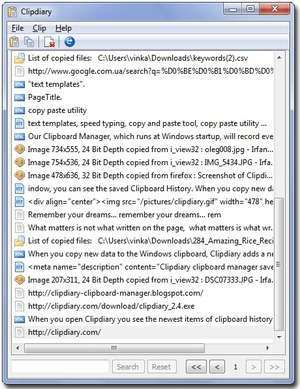 Clipdiary clipboard utility saves not only text data, our clipboard manager works with pictures, files, html links, text with formatting. You can easily reuse once copied pictures and even the whole files! The utility, which runs on Windows startup, will record everything placed on the clipboard into the database. At any moment, you can view the clipboard history, copy the item back into the cache memory or paste it into an application. Version 5.14 is a freeware program which does not have restrictions and it's free so it doesn't cost anything. For security reasons, you should also check out the Clipdiary download at LO4D.com which includes virus and malware tests. Additional screenshots of this application download may be available, too.